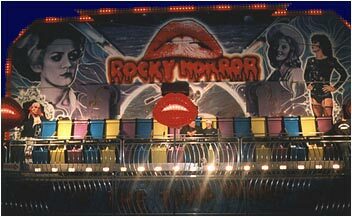 Should you ever visit Blackpool, England, take a visit to the South Pier where there is currently a fairground ride with a Rocky Horror theme. The Ride is fairly basic and spins a row of seats at speed, occasionaly stopping in mid spin. If you do visit the ride, don't eat anything first! The photographs on this page were taken during October 1997 by Dave Hawes. 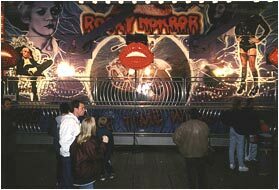 We haven't visited Blackpool for a while ourselves so the ride may no longer be there. However this was a great thing to see at the time and really wasn't a TimeWarp April 1st surprise!